Because so many people are asking “Are dogs allowed at the Alamo,” we decided a blog was definitely called for. Because dogs are only allowed outside of the buildings and on the sidewalks, it’s best to leave them at a doggie daycare, kennel or pet sitter, as it is absolutely worth the visit. You can find listings for kennels, doggie daycares and pet sitters near the Alamo on the Vacation Pet Friendly San Antonio Travel Guide. Each year, a minimum of 2.5 million people visit the Alamo and for good reason. It’s one of America’s most historic sites. Most come to see the old mission where a small band of Texans held out The Alamo has been managed by the Daughters of the Republic of Texas since 1905. It was the first major military battle for the independence of Texas, which spanned ten years. It was a revolution. Americans and Mexicans had settled the Texas territory. It was secured by a Mexican constitution and the promise of land that they could call their own. But with the rise of Antonio Lopez de Santa Anna as Mexico’s President, the dictatorship abolished the 1824 constitution and reneged on the land deals that were put in place by the former Mexican government. Located in a complex called Alamo Plaza in downtown San Antonio, Texas, the Alamo represents nearly 300 years of history. Three buildings – the Shrine, Long Barrack Museum and Gift Museum – house exhibits on the Texas Revolution and Texas History. Visitors are welcome to stroll through the beautiful Alamo Gardens. The Alamo is located a short distance from the River Walk and is a “must see” for all who come to San Antonio. Although the Alamo sits upon 4.2 acres, most come to see the mission where, for thirteen days, a small band of Texans held out against the Centralist army of General Antonio Lopes de Santa Anna. It was the first major military battle for Texas independence. On the second day, William Barret Travis wrote a letter, which is one of the most famous from the battle. I am besieged by a thousand or ore of the Mexicans under Santa Anna. I have sustained a continual bombardment and cannonade for 24 hours and have not lost a man. The enemy has demanded a surrender at disccretion, otherwise, the garrison are to be put to the sword, if this fort is taken. I have answered the damand with a cannon shot and our flag still waves proudly from the walls. I shall never surender or retreat. Then, I call on you in the name of liberty, of patriotism and everything dear to the American character, to come to our aid, with all dispatch. The enemy is receiveing reinforcements daily and will no doubt increase to three or four thousand in four or five days. If this call is neglected, I am determined to sustain myself as long as possible and die like a soldier who never forgets what is due his own honor and that of his country — Victory or Death. The fighting contintued for days and the enemy forces grew. By the twelfth day, it became obvious to Travis that time was running out. 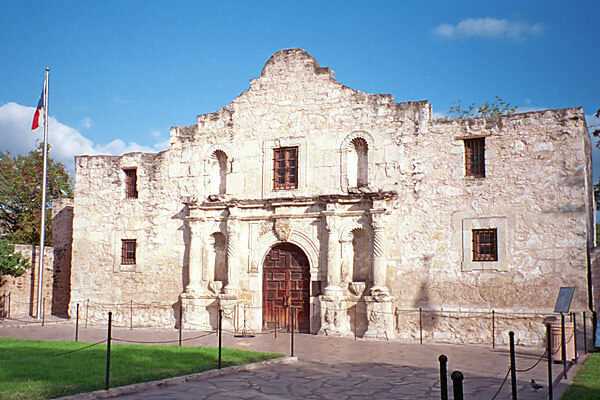 That Saturday evening at sunset, Travis stood before the weary group of Texan fighters in the Alamo chapel courtyard. He drew a line in the sand with the tip of his sword and offered his men a final choice.Did they want to escape the church that had transformed into a fortress before it was too late with the assurance they would go with his blessing, or, were they prepared to give their life in the name of freedom. One man left with a handshake and Travis’ blessing. The others crossed the line to join Travis in their final fight to the bitter end. In the early hours on March 6, 1863, the Alamo fell and the death of its defenders has come to symbolize the sacrifice and courage in the name of Liberty. Legend Davy Crockett who was a Tennessee mountaineer, was most famous as an Indian fighter. He was relatively uneducated but his popularity earned him a seat in the U.S. Senate. When he lost his bid for re-election, he went to Texas and joined the “Tennessee Boys” to defend the post at San Antonio. Other legends such as Sam Houston, William B. Travis and James Bowie also are honored as defenders of the Alamo. The Texan Army was led by Sam Houston who shouted the well known “Remember the Alamo!” as it routed General Santa Ana during the battle of San Jacinto. The date was April 21, 1863. It’s been 300 years, yet this historic time in our history has never been more remembered. Since 1905, the Alamo is managed by the Daughters of the Republic of Texas. The Alamo is located in downtown San Antonio, Texas in Alamo Plaza. There are three buildings of interest: the house exhibits on the Texas Revolution and Texas history, the Long Barrack Museum and Gift Museum, and the Shrine. Visitors are invited to stroll the Alamo’s gardens. It’s located a short distance from River Walk. For large groups, reservations should be made by calling 1-866-769-8419. We hope to have answered your question: are dogs allowed at the Alamo, even if we took a roundabout way of doing it. If you are traveling with your pet from out of town, Vacation Pet Friendly has the largest selection of pet friendly hotels online, with more than 113 in San Antonio. Because of our relationships with the hotels, we offer special rates and often such added benefits as free buffet breakfasts at many of our hotels. Remember, booking early is essential when traveling with pets. See what’s available today so you get the best deals. Start your search for pet friendly hotels in San Antonio here. Then sit back and think of all the fun things you can do when you get there!